We are an entirely mobile company. that means we bring the boards to you at no extra cost. Never leave the dock, just give us a date and time and we will meet you there. Please check the terms and policies at the bottom of the page for rental terms. all rentals include lifejackets and all necessary gear. Need a rental for just the day? Board rentals between 9am and 8pm are $40. Pick it up, have it delivered, or have us meet you at a launch point to paddle an entirely new lake. One of the best times to paddle is in the early morning and just after dinner. Take advantage of the calm water for a sunset paddle and early morning paddle. Rentals for a 24 hour period are just $60. Rent the board for however long you need. Mix and match 24hr and daily rentals up to 4 days, after 4 full days consider the weekly rate. After 4 full days, rent the board for 3 extra days for just $10 extra. Weekly rates are for a full 7 days at just $250. Lessons are by appointment only. Take a private lesson for $80 or gather a group up to 6 for just $60 per person. Lessons will take place on weekend only and should be booked a couple weeks in advance to ensure availability. If you are not sure where to paddle but still want to get out on the lake, a private tour is a great choice. 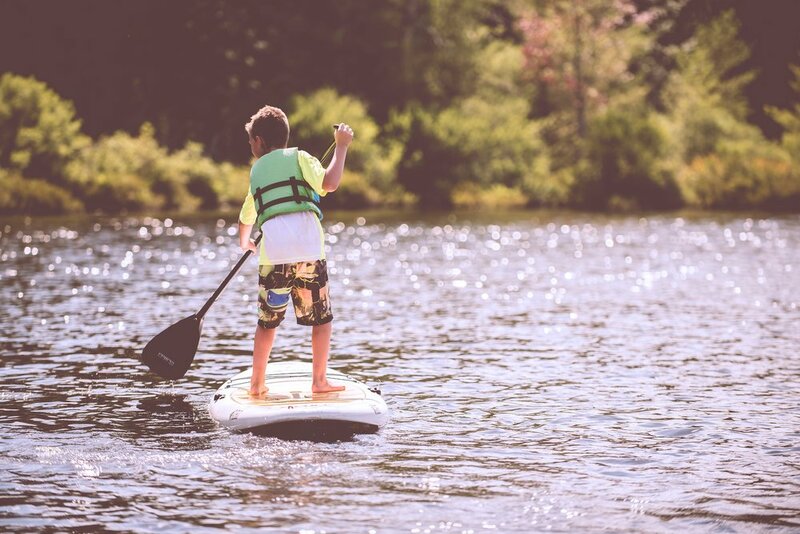 We provide all equipment and provide a basic rundown of how to paddle for beginners. Not as in depth as a lesson. Tours should be booked 2 weeks in advance to ensure availability.